advanced students (7-year-old and up). and are able to surf after just a few lessons. techniques, etc.) and one full hour in the water. a towel and a bathing suit. We teach 7 days a week, 365 days a year. lesson. Surf is best in the early morning. you what time is best. group class, or just join a class that we are putting together. 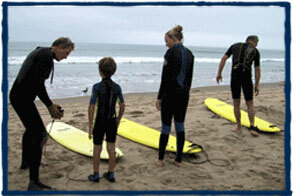 under 14 enroll in a private lesson as we strongly feel they need constant supervision while in the water. dad & son(s) team choosing this option. A semi-private lesson is $100 per person. Surfing is an amazing and thrilling sport. 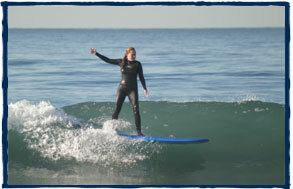 If you have reasonable athletic abilities, we will get you surfing! surfing. Book your lesson today! All images and text owned by Surfing L.A. Surf School /Tom Grubbs.